This in-field repair system is designed to fully cure in 30 minutes. Requiring no tools or hot work, the system includes pipe repair tape and hand-moldable epoxy. 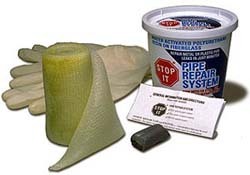 The tape is knitted fiberglass coated with special urethane resins that are water-activated. It is ideal for repair of pipe leaks and reinforcing pipe joints in any situation including under water. The epoxy sets rock hard in 20 minutes and is perfect for plugging leaks, filling cracks and complex voids and offsets. InduMar Products, Inc./Stop It Pipe Repair System, 3355 West Alabama, Suite 110, Houston, TX 77098. Tel: 713-977-4100; Fax: 713-977-4164.